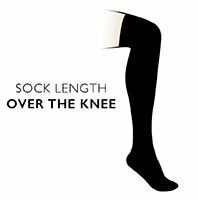 Long and luxurious, whether you wear them pulled up or scrunched down Tavi Noir Thigh High Yoga Organic Cotton Socks keep legs warm and muscles ready to perform, whether your preference is for dancing, barre, Pilates or yoga classes. Tavi Noir Thigh High Yoga Organic Cotton Socks’ high-density BPA-free PVC grip patterned soles help your floor traction and stability, with the technical triangle grip pattern based on surfboard traction pads. A woven-in arch band gives pressure, support and comfort for the mid-foot. The use of quality, earth-friendly organic cotton rich fabric allows feet to breathe and stay cool while you concentrate on working up a sweat.